THE ugly moment Wallabies players were attacked by livid fans on the Gold Coast has been captured live on TV by Fox Sports cameras. 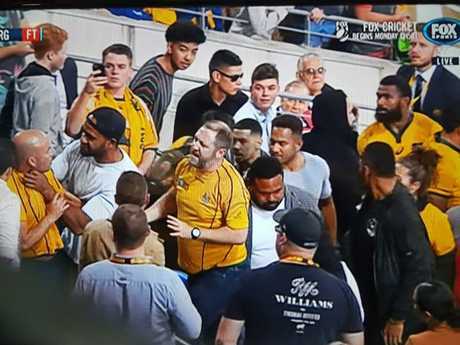 Fans appeared to berate Wallabies players on the sidelines after Australia's dramatic loss to Argentina at Cbus Super Stadium on Saturday night. One fan was heard in the background of a live interview swearing at players. 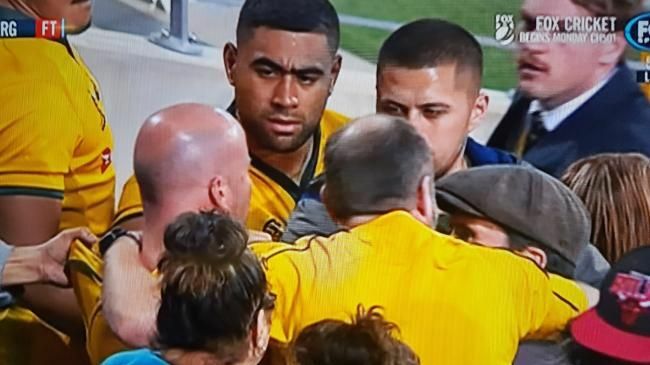 One minute later Fox Sports returned to capture the moment the heated exchange turned physical when a fan had to be dragged away from star Wallabies Lukhan Tui and Pete Samu. Tui at one point was spotted charging in and trying to reach over the top of a person in front of him to lash out at a fan in the centre of the fracas. 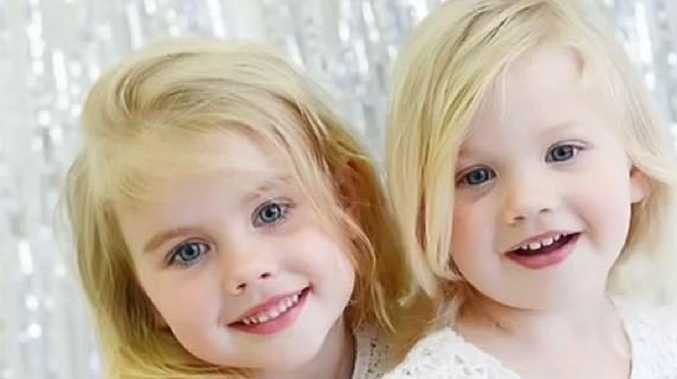 The shaven-headed spectator, who was wearing a Wallabies jumper reportedly brought nearby children to tears as the fragile situation threatened to erupt near the Cbus Super Stadium tunnel entrance. The fan was then dragged away by another fan, throttled as he was dragged away from the front row. A group of around 10 people, including several Wallabies players were involved in the scuffle. Samu was visibly shaken by the incident. Fox Sports commentator Nick McArdle said the Wallabies star appeared on the verge of tears. "That is not understandable, that is not acceptable," he said of the fan's attack. "He's almost on the verge of tears there, you can see that he's very, very upset." Former Wallaby drew Mitchell said it was "ridiculous". Fox Sports rugby analyst Rod Kafer said: "It looked ugly. "It was one fan who was upset and got vocal. "It was a high tension moment that got calmed down quite nicely." The moment all sparked after a fan was heard yelling at Wallabies players in the background of Kafer's post-match interview with Dane Haylett-Petty. 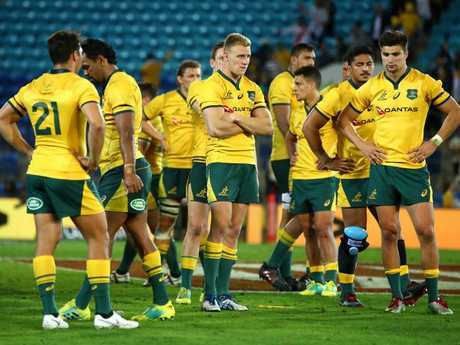 It capped off a miserable night for Australian rugby. 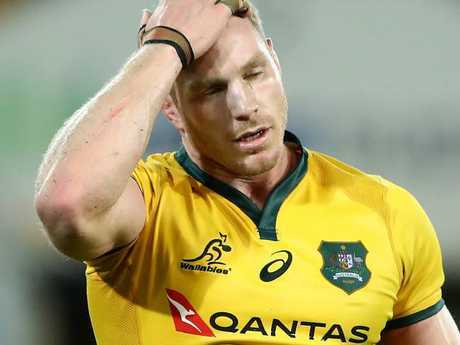 Australia slumped to their first home loss to Argentina in 35 years, falling 23-19 in Saturday night's Rugby Championship Test. Folau had an unmarked Bernard Foley to his right but inexplicably chose not to pass the ball to him and instead coughed uppossession as he tried to score himself. Sanchez extended Argentina'slead to six points with a 48th-minute penalty, and they were never headed from there.